Hello Alinoa Thanks for listening! Here is Michel Gico (michelgico@gmail.com) just got your email .... I'll send the data to the ROC Server What I want to open! All tracks over 45 seconds! Last edited by Gico on 23 Feb 2013 01:19, edited 1 time in total. I would like to signup in the queue for roc servers. I want my server remains. There's little point in running ROC servers in April since the ladder has not been working in April and there's no actual reason to believe they will. I hate to do this, but after a week this looks much more like deliberation than a problem. The problem should be fixed now, could you please check that everything is working fine on your side ? Last edited by PrimevalTree on 11 Sep 2013 20:21, edited 1 time in total. I edited the topic, next ROC servers rotation should start in February / March 2014. A new rotation of TMNF / TMUF 80/100k servers will start in March. Please send me a private message if you want to be added into the waiting list. PLEASE put me into the waiting list. I would like to continue the RoC Server. 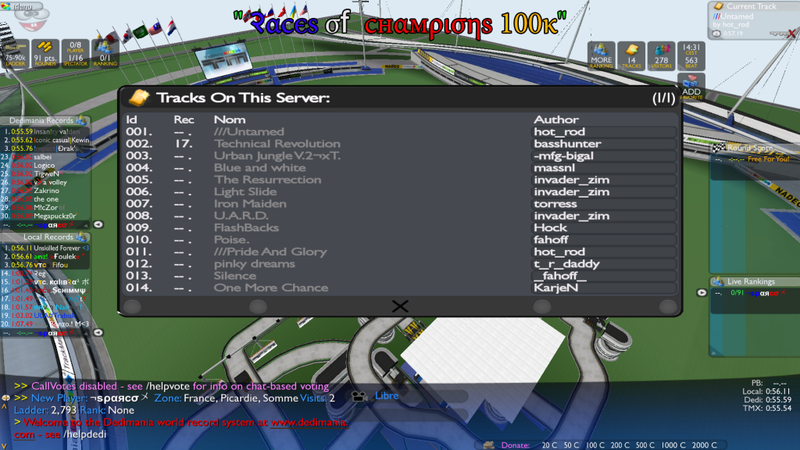 There are still some slots available for the next ROC servers session.